Earlier today, the SEC reported that the CBOE BZX exchange withdrew it’s ETF application (yes – the highly anticipated VanEck-SolidX one). So far, we’ve yet to see an official reasoning surface but the withdrawal may imply two things: (1) that the CBOE was expecting a denial and (2) that they didn’t want another SEC order to create unnecessary market mayhem. Some are speculating that the ongoing government shutdown was a major factor behind the decision. Nevertheless, there will be no more bitcoin ETF in Q1 2019. 💸 As of right now, the market doesn’t seem to actually give a damn. Prices have been quite stable since the news drop. 👥 CBOE wasn’t “denied” by any means. Instead, this decision was simply voluntary. It’s safe to assume the involved parties have been in active discussions with the SEC and any feedback was used prospectively. Credit Karma’s recent survey found that US bitcoin investors realized losses of $1.7 billion after selling their BTC… and the investors who are still holding are sitting on unrealized losses of $5.7 billion. Nothing surprising here. The main point of the survey was to find out how many folks are planning on reporting the realized losses on their taxes this season. Interestingly enough, Credit Karma found that only 53% of these BTC sellers plan on reporting their losses. But the big eye-opener is that 58% of respondents didn’t even know that they could claim a tax deduction for their cryptocurrency losses. To refresh everyone’s memory, we featured a piece over the holiday break covering this (evidently) overlooked tax strategy. As a schoolteacher, Jason Bond was $250,000 in debt, working side jobs grinding 90+ hours a week but still stuck with no hope… Until he put his passion and hunger for success into the stock market, where he learnedTHREE simple patterns that would forever change his life. Jason gained 188% in 2015, 30% in 2016, 284% in 2017 and is on pace to do it again in 2019. Take a minute and watch exactly how Jason did it. Since launching last week, the crypto community has been buzzing about Grin. So what is it, and why are people excited? Saddle up, here’s your Grin FAQ. Grin was launched under a pseudonym, reminiscent of bitcoin’s go-to-market. A darknet vendor is supposedly selling 100,000 personal documents that were used to pass KYC on Binance, Bitfinex, Poloniex and Bittrex. The documents were supposedly ‘dumped’ early 2018 when a third party KYC solution provider suffered a breach. The documents allegedly include selfies, scans of identity documents and proof of address of each person. Following the publicity, the vendor is now debating whether to start a crowdfunding campaign to delete all the hacked documents. One story in crypto is the price story — how speculative investments in cryptoassets are performing. In 2018, that story wasn’t so positive, seeing a massive return to earth after 2017’s run up broke gravity. Another part of the crypto story, however, is the evolution of the underlying tech stack. Still another is the broader global social context that creates a need for those decentralized, censorship-resistant technologies. In those contexts, 2018 tells a very different story. At Aragon, they sit at an interesting vantage point, not only developing technology but getting to watch as hundreds of projects and organizations start to build on top of that technology. From where they sit, 2019 is poised to be the year of the DAO. There was a lot of talk last week surrounding Ethereum’s highly anticipated Constantinople upgrade and its hours-before-launch emergency delay that took place. So we wanted to share @Mycrypto’s thread who took the time to defuse all the misinformation and clamor. For more of a background on Ethereum, we suggest you read this year in review essay written by Josh Stark, Evan Van Ness, and Daniel Zakrisson. Abra is the only app that allows everyone, everywhere to easily and securelybuy, store, and invest in 30 cryptocurrencies. Fund your account using bank transfer, credit/debit card, bitcoin, bitcoin cash, or litecoin and start investing. Get $25 FREE in BTC for making your first deposit with Abra. 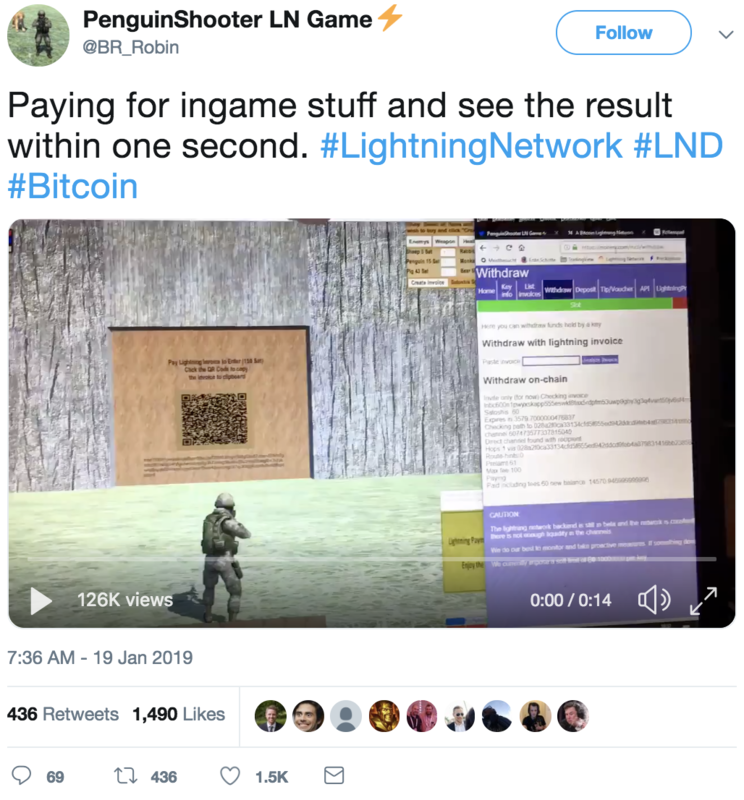 Here’s our favorite non-profit research and crypto advocacy group demonstrating the Lightning Network (LN) in front of Congress last week. The well-attended briefing was the first of many that the Congressional Blockchain Caucus plans to hold in 2019. Why is $1B bitcoin giant Bitfury building a blockchain music service? 📌 Hedge Funds Short Crypto, Kik Fights SEC, and XRP Overstated?